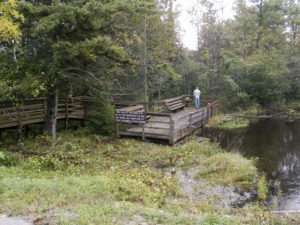 Please find below the September 17th, 2016 Work Project Report ( WPR ) where the Green Bay chapter of Trout Unlimited ( GBTU ), along with the Marinette chapter of Trout Unlimited ( MTU ), worked with Kyle Siebers, Shawn Sullivan and Jonathan Pyatskowit, of the Wisconsin Department of Natural Resources ( WDNR ) on Beaver Creek west off of 141 where the creek crosses 21st Road in Marinette County. This is known to many as Holly’s Hole and there is a fishing platform there from years hence. 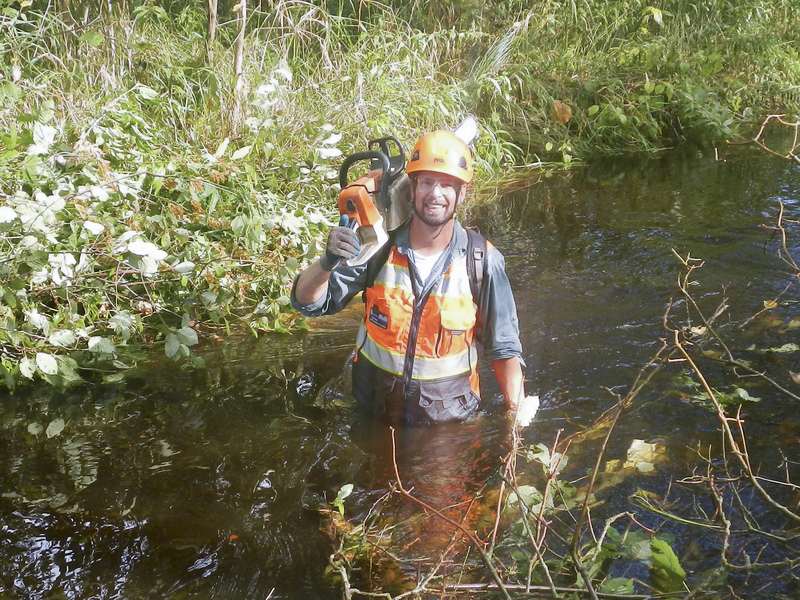 CLICK HERE for GPS coordinates to the work site. 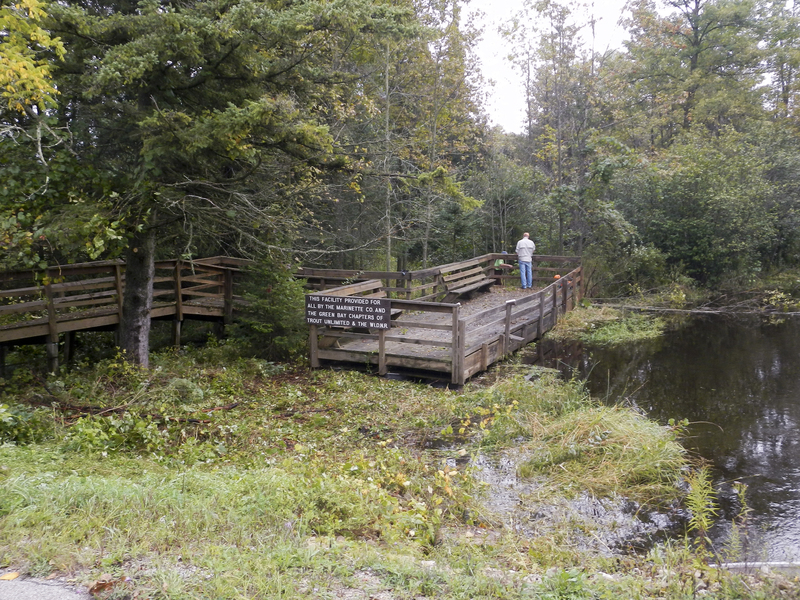 The job started with the clearing of brush, tag Alders, small conifers, vines and weeds around the platform so the WDNR can continue to work on the platform next several years. The platform is going to have to have some serious love thrown down on it to restore it to usability over the long term. Watch your step when walking on the platform as the mildew grown on the cedar surface is very slippery. 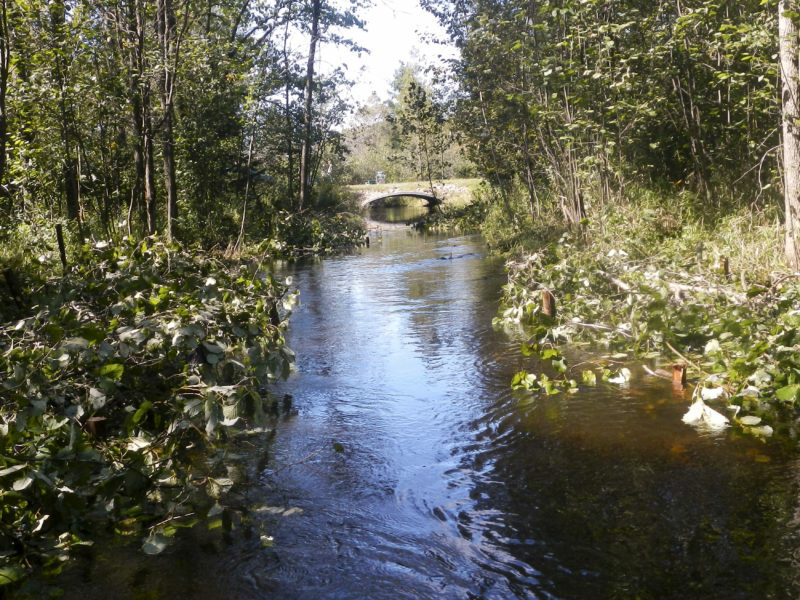 Further downstream, the crews broke into two and cleared tag Alder, bundled them and placed them to narrow the stream channel. We also placed several cedar logs. 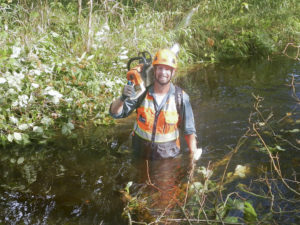 Chainsaws, loppers, sledge hammers and muscle were the main tools used in the work along with the typical need for waders, boots, gloves, long sleeve shirts, hats, small hand saws. The water was too deep to do any dredging so hopefully we’ll get back to that next year. Lunch was graciously provided by MTU. They provided subs, from Katie’s Subs located in the quaint town of Pound, WI, along with chips, cookies and beverages. We munched down at the pavilion located at Edward Gengler Memorial Park near the Pound ball diamond. You can CLICK HERE for GPS coordinates to the park. Note: Please note when traveling to the ball diamond, south on 141, from the work site. You’ll need to exit 64, go west a few tenths of a mile to old 141 and then turn left and travel south to the center of Pound. Once you’re in the center of Pound, the above GPS coordinates will get you right to the spot. The 15 folks in attendance included Harold Becks, Don Denowski (MTU), Doug Erdmann (MTU), Jodi Korch (MTU), John LeBeau (MTU), Dave Lengas (MTU), Chip Long (WDNR), Lee Meyers, Jonathan Pyatskowit (WDNR), Mike Renish, Doug Seidl, Jeremiah Shrovnal (UWGB), Kyle Siebers (WDNR) and Shawn Sullivan (WNDR) and his son Ethan. Please check out the Gallery of Photos !